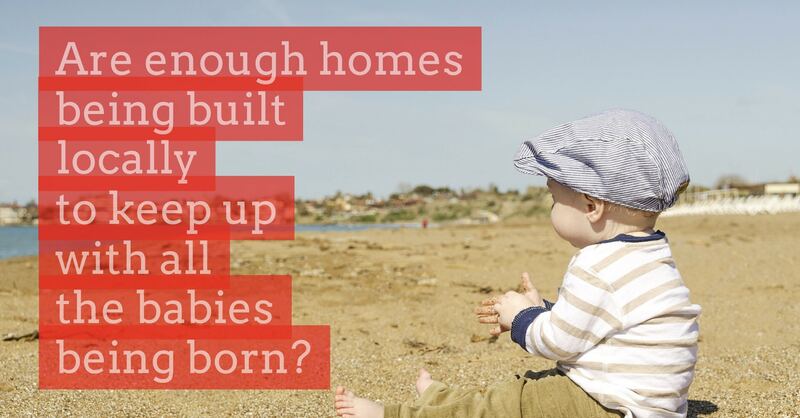 More than 5 babies have been born for every new home that has been built in Canterbury since 2012, deepening the Canterbury housing shortage. This discovery is an important foundation for my concerns about the future of the Canterbury property market - when you consider the battle that todays twenty and thirty somethings face in order to buy their first home and get on the Canterbury property ladder. 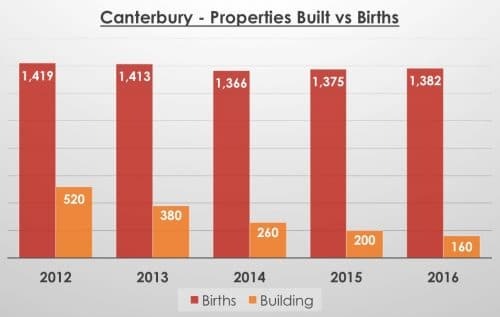 This is particularly ironic as these Canterbury youngsters’ are being born in an age when the number of new babies born to new homes was far lower. This will mean the babies being born now, who will become the next generation’s first-time buyers will come up against even bigger competition from a greater number of their peers unless we move to long term fixes to the housing market, instead of the short term fixes that successive Governments have done since the 1980’s. 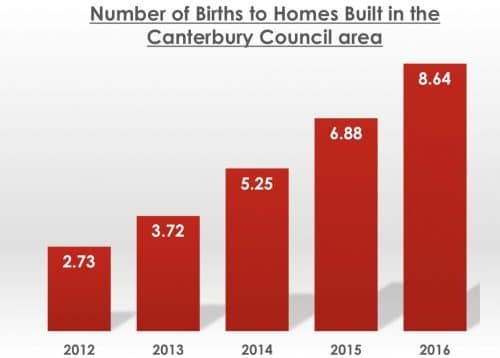 It can be seen that in 2016, 8.64 babies had been born in Canterbury for every home that had been built in the five years to the end of 2016 (the most up to date data). Interestingly, that ratio nationally was 2.9 babies to every home built in the ‘50s and 2.4 in the ‘70s. I have seen the unaudited 2017 statistics and the picture isn’t any better! (I will share those when they are released later in the year). Our children, and their children, will be placed in an unprecedented and unbelievably difficult position when wanting to buy their first home unless decisive action is taken. You see it doesn’t help that with life expectancy growing year on year, this too is also placing excessive pressure on homes to live in availability, with normal population growth nationally (the number of babies born less the number of people passing away) accumulative by two people for every one home that was built since the start of this decade. Owning one’s home is a measure many Brits to aspire to. The only long-term measure that will help is the building of more new homes on a scale not seen since the 50’s and 60’s, which means we would need to aim to at least double the number of homes we build annually. In the meantime, what does this mean for Canterbury landlords and homeowners? Well the demand for rental properties in Canterbury in the short term will remain high and until the rate of building grows substantially, this means rents will remain strong and correspondingly, property values will remain robust. Slowing Canterbury Property Market? Yes and No! How Did Brexit Affect the Canterbury Property Market in 2018 – and its Future for 2019? Keep track of your favourite properties, request viewings and track your offers all from the comfort of your own home or on the move. Which Canterbury Properties are Selling the Best? Sitemap © 2019 All rights reserved. Designed by The Wow Factory.